Paris Junior College’s new PJC - Greenville Center campus opened to students for the fall 2008 semester. The PJC - Greenville Center is a warm, friendly place where staff and students alike are eager to assist and encourage new students. It is located at 6500 Monty Stratton Parkway in Greenville, Texas. The 39,000-square-foot state-of-the-art facility opened to students for the fall 2008 semester and offers general academic courses that lead to an associate’s degree in arts or sciences. The Center also provides technical programs where students can earn a certificate of completion. 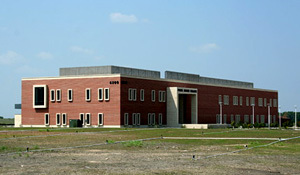 The Greenville Center campus contains classrooms, a science lab, a computer lab, a library, a large meeting room that can also be used as a classroom and administrative offices. The college offers a variety of certificate programs in office occupations, computer training, heating and air conditioning and nursing. Counseling and advising are available to students, and learning skills programs are in place to help students progress. Free tutoring for math, English, science and Spanish is available, call 903.454.9333 for more information. The Greenville Center also offers a variety of continuing education classes, including technical training courses. There is an active chapter of Phi Theta Kappa, a student Honor Society that is involved in many community service programs. Also, Honor Society students may be eligible for scholarships through Phi Theta Kappa membership. The Greenville Center is committed to, and aggressively pursues academic and social opportunities for its students and community. It works closely with local businesses to develop a workforce for the future.